"This is a super easy and very fresh summer salsa using avocado, corn, red pepper, shallots, cilantro, and lime juice." 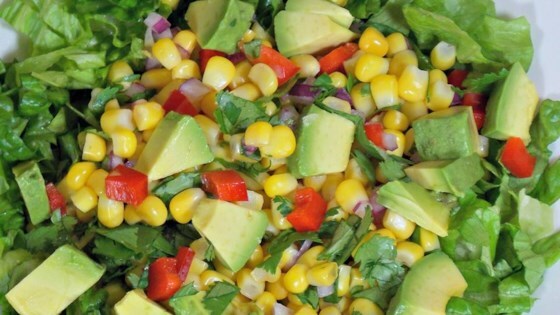 Gently mix corn, avocados, cilantro, lime juice, shallots, red pepper, salt, and pepper together in a bowl. Made this to use on top of chicken burrito bowls. This was so delicious that we ended up eating this by itself when we were done with dinner. It was amazing and quick and easy to make. This was delicious, I made it for 8 - added an extra half of avocado, more pepper and used red onion vs. shallot. Was amazing, big hit!! Best I ever tasted. My husband also loved it!!! Perfect! Make it, you will love it!